You’ve got to pay to play, and that’s especially true if you want to play PC games with Nvidia’s most powerful graphics option: two GeForce GTX 1080 cards in SLI. Not only will the cards themselves cost you royally ($599 each at a minimum), but you’ll also have to throw down $40 for a new, special SLI HB Bridge, so says Nvidia. The HB Bridge is required, Nvidia claims, because the GeForce GTX 1080 cards pass so much data under heavy loads that older bridges just can’t keep up (the HB stands for “high bandwidth,” mind you). The company says the HB Bridge will transfer data at 650MHz on GeForce GTX 1080 cards compared to the 400MHz that older GeForce cards achieve with soft bridges, such as those that come bundled with a motherboard or GPU. The older soft bridges will still work, but only up to a point. You can also use the aftermarket fancy SLI bridges that sold with the last gen of cards, but even those won’t achieve maximum potential, according to Nvidia. As if plunking down more money for a new SLI bridge weren’t bad enough, getting the HB Bridge seems to be a difficult task. They’ve been sold out on Nvidia’s site, and even PC OEMs say they’re hard to come by. Good luck getting the SLI HB Bridge. They were sold out whenever we checked over the past couple weeks. We were fortunate enough to have Digital Storm’s tricked-out Aventum 3 PC in house, which features two liquid-cooled GTX 1080 cards in SLI, using the SLI HB Bridge, naturally. 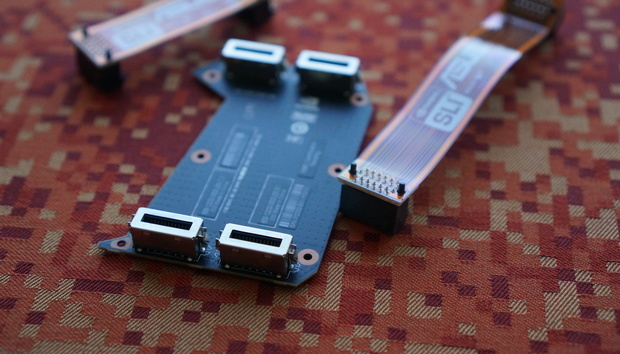 Like the previous "Pro" bridges, the HB Bridge consists of a hard PCB that uses both connectors on the GPUs. A view of the back of the HB Bridge, and a closer look at the connectors below. Gordon Mah UngA closer look at the connectors. Normally, the HB Bridge comes with a fancy black-and-silver cover, but Digital Storm removed that in the Aventum 3 to accommodate the water block. The front of the HB Bridge with its cover removed. The small connector in the PCB connects to an LED. But who cares how it looks, right? You want to know if Nvidia is selling you snake oil. To test the necessity of using the new HB Bridge over a standard flexible SLI bridge solution, I ran a series of benchmarks on the Aventum 3 with three different scenarios: the HB Bridge, a single flexible SLI bridge, and two flexible SLI bridges in tandem. While conventional wisdom used to be that a single bridge was sufficient for a two-card setup, there’s been a growing belief that two bridges are “better.” In fact, one PC OEM told me he’s heard anecdotal reports of two soft bridges working nearly as well as the HB Bridge. While I would have liked to have tested a previous-gen Pro bridge as well, I did not have one on hand for this comparison. For the first test, I turned to 3DMark Extreme Ultra, which runs at 4K UHD resolution. What I focus on here is the graphics portion of the test. The results indeed show that the HB Bridge yields higher performance but it’s pretty insignificant. You’d likely get more value buying a $40 mouse pad. The results form 3DMark FireStrike Ultra make the old soft bridges look pretty good. Of course, 3DMark is just a synthetic test. Next I turned to a real game, Far Cry Primal set to Ultra and at 4K res. Same underwhelming results. And no, this isn’t some SLI scaling issue, as going from one GeForce GTX 1080 to two yielded a considerable performance increase. It just seems like that fancy bridge doesn’t matter much. Far Cry Primal at 4K UHD on Ultra settings doesn’t care about that fancy bridge either. We finally start to see the HB Bridge make a difference in Middle-earth: Shadow of Mordor. I ran the game at 4K resolution with the 4K texture pack installed. Still, that roughly 10 percent difference isn’t going to set the world on fire. Middle-earth shows a minor delta between the fancy bridge and freebies. Before your eyes glaze over and you decide you don’t need to see any more—that the internet conspiracy theory is true: “Nvidia’s just ripping us off; the free bridges work just fine!”—there’s more to be said. Nvidia claims that its fancy bridge is actually paying off in ways that your eyes can see but benchmarks won’t record. “Measuring frame time data you would see how the extra bandwidth smooths out delivery of the frames for a more consistent game experience,” an Nvidia official said. While I didn’t have time to use Nvidia’s Frame Capture Analysis Tool for this story, I will say that in my personal experience of watching repeatable benchmarks, I observed more artifacts with the soft bridges than the HB Bridge. I also saw the HB Bridge pay off pretty big measurable returns in some games. Moving on to Tom Clancy’s Rainbow Six Siege, we can see a roughly 15 percent gap open up between the soft bridges and the $40 HB Bridge. Rainbow Six Siege shows a nice return on investment for that $40. Our biggest return on investment comes from Tom Clancy’s The Division where we see a massive gulf of roughly 25 percent open up between the free bridges and the HB Bridge. As with the other games here, I ran The Division on the Ultra setting at 4K resolution. Tom Clancy’s The Division makes that fancy $40 HB Bridge seem worth it. I was curious about the delta if I ran The Division at 5K resolution, or 5120x2880. That’s about 14.7 million pixels vs. a typical 4K UHD panel’s 8.2 million pixels. With the massive increase in output, you can see that higher-bandwidth bridge really paying off. Crank the resolution up to 5K and the gap grows even larger with the HB Bridge. The final proof that Nvidia isn’t just bilking us is evident in the maximum frame rate. With Middle-earth: Shadows of Mordor running at 5K, the average frame rate is pretty, well, average, with the HB Bridge: 79.6fps vs. the soft bridges’ 74.9fps. When you look at the maximum frame rate in the game, however, the HB Bridge has a clear performance advantage. So yes, that HB Bridge is doing something positive. Maximum frame rate in Middle-earth. The final answer may seem a little muddled but it’s pretty crystal clear to me. First, Nvidia says you really don’t need the HB Bridge if you’re playing games at 1920x1080 or 2560x1440—you can stick with your old soft bridges. But why bother? If you’re using a pair of GeForce GTX 1080 cards to play at such a low resolution, you’re doing it wrong. That’s just too much GPU for the job. At resolutions of 4K and 5K, the tests show that it’s not worth cheaping out on the $40 HB Bridge, especially after you just put out $1,200 or more for a pair of the world’s fastest GPUs. So just deal with paying for the bridge—if you can find one, that is—since you’re already in for a pound. If you’re really pushing the resolution, then don’t cheap out by trying to reuse those old SLI bridges.